can have an impact on your future? Your social media sites are increasingly being viewed by everyone from college admissions workers to future employers. What you have posted there is seen as a reflection of who you really are ~ above and beyond what is found on your application or resume. Do you really know what they will see? The current generation of graduates and those looking for their first “real” job have grown up on social media. Many joined Facebook in their early teens and are now also on other sites like Twitter, Snapchat, Instagram, and more. They have memorialized their lives through pictures and posts on everything from what outfit they wore, what they ate, who they date, and the parties they have been to. Their timelines document everything. But now, as they are getting older, things are changing. Social Media should now become an avenue for creating a more professional identity. Employers and recruiters look. They “google” you. They check out your social profiles and your own posts, and even posts where you are “tagged”. While this may raise some privacy questions, it is not illegal to look. However, it is important to remember that asking you to supply your passwords to these accounts is. No recruiter or employer should ever ask for them ~ and you should always think twice before giving that kind of access to anyone, even friends! Now new graduates and job seekers are beginning to think about how their profiles will look to potential employers and admissions officers. Thinking of applying to college? The impression you make on an admissions officer is not just based on your application or SAT scores. 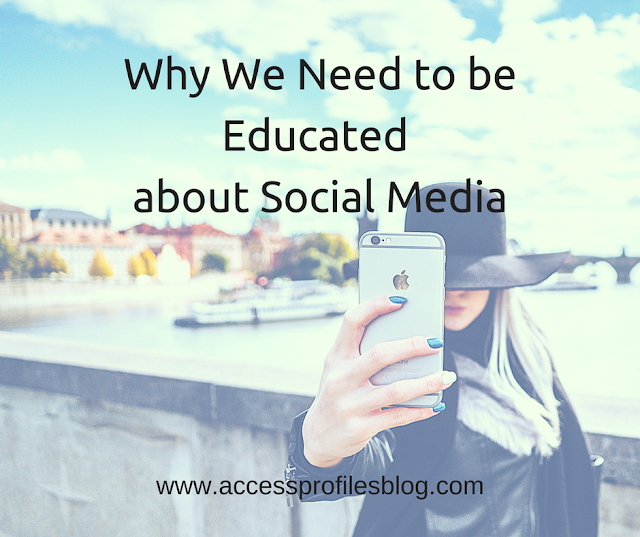 Instead, many are using social media as a way to get a better overall picture of you. They look for posts that highlight things not always found in applications ~ volunteer work or causes important to you. These types of things will put you in a more favorable light and increase your chances of acceptance. However, negative posts will do the opposite, and may even result in you being rejected. Posts that show illegal, questionable, or even violent behavior may cause you to be passed over. Do any or your posts or profiles contradict what you may have listed on your resume? This is certainly a “red flag” when it comes time to make you an offer. 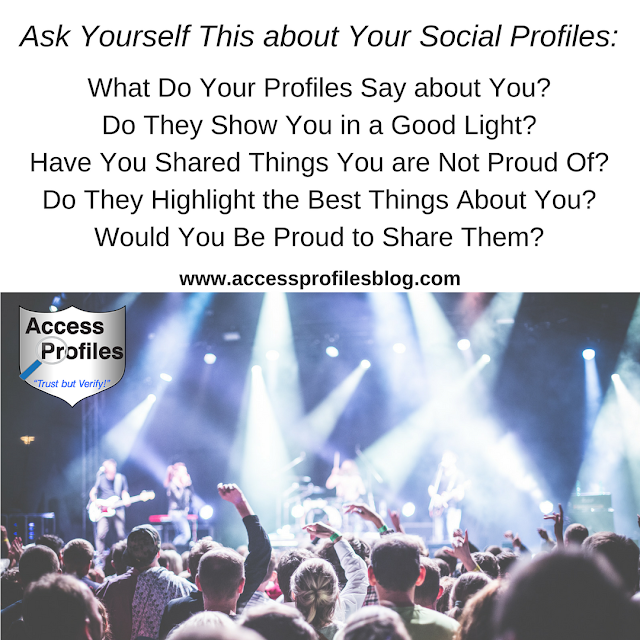 you need to ask yourself some hard questions about your social profiles. In fact, they would be excellent questions to consider before you even post! What do your Social Profiles say about You? Do they show you in a good light? Have you shared things you are not proud of? Do they highlight the best things about you? Would You be Proud to Share Them? The answers to these questions should prompt you to take a good look at what is “out there” about you, and change what you can! Many of us have posts on our social profiles that were made long ago that we may have forgotten about or wish we had never shared. We may even think that no one will ever look. But it is these kinds of posts that can come back to haunt you! If a post shows illegal behavior ~ delete it. from a party or vacation? The key is to look at your social profiles with a detached eye. See what others are seeing. Then you will know what changes you need to make. This does not mean your profiles should look generic or should be so white washed as to be devoid of all personality. But what it does mean is that what you have posted in the past should not derail you from your current goals. That is why I advocate doing a “background check” on yourself before you even think of applying for college or a job. Knowing in advance what they will find gives you the opportunity to change what you can and be ready to explain what you cannot. Find out how in “Why You Should Run a Background Check on Yourself”! this is reactive, not proactive. you are ready to go to college or get a job. It needs to be taught both at home and especially in our schools. Emphasis should be placed on understanding the implications of what you post, recognizing what those posts say about you, and how best to use social media to your advantage. It can’t only be about cleaning up what you have already shared, it needs to be about being savvy about what you post in the first place! Rejecting those unflattering party pics and instead choosing posts that highlight what you truly care about, “your best you”, is key. “Since you know that your social media posts and profiles will most likely be seen as part of the hiring (and college admission) process, why not use that to your advantage? When setting up your profile, make sure you present yourself in a good light. Highlight your education, professional accomplishments, charity work, and volunteer activities. Creating a page that shows you are an interesting and accomplished individual can help. excerpt from “Social Media Background Checks ~ The Good, the Bad, and the Ugly, Part 1”! And for more tips on getting hired, check out “Attention New Grads ~ What You Need to Do to Land Your First Job”! While changing attitudes about social media may eventually make this kind of “cleansing” of past posts unnecessary, we are not there yet. long before it could effect your career. And that needs to start at home and, most definitely, in the schools! and share this on your favorite social sites! Thanks! And be sure to Contact Us for help in finding out what is “out there” about you!